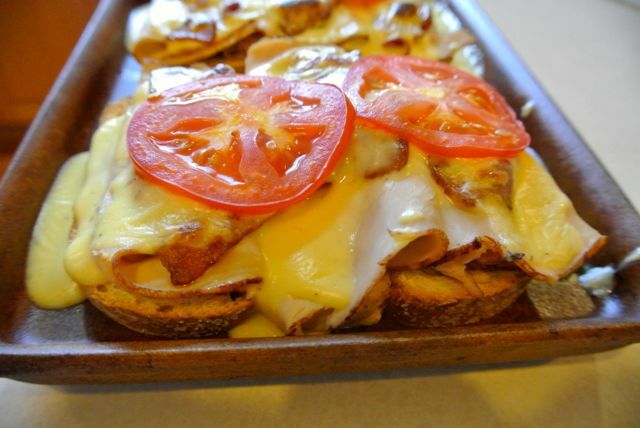 What do you do with tomatoes & cheese that need to be used? Why make Hot Browns, of course! The recipe calls for 1/2 cup of butter, but I usually use 1/3 cup. It also calls for cheddar cheese. Tonight I needed to use American & it turned out just fine. I put in a little more than the 1/2 cup called for since American is much more mellow than cheddar. I used 9 slices of real American, not processed American. Top evenly with turkey & bacon. Pour desired amount of cheese sauce on each sandwich. Broil 6 inches from heat until bubbly and lightly browned. Gradually whisk in milk. Bring to a boil and cook, whisking constantly, until thickened. Stir in cheese until melted. Stir in salt and pepper.